Wärtsilä and Tarbit Shipping sign contract to convert tanker to LNG operation for reduced NOX emissions. Wärtsilä, the marine industry’s leading ship power solution provider, has signed a turnkey contract with Tarbit Shipping of Sweden to convert a product tanker to LNG propulsion, and to supply the ship with a Wärtsilä LNGPac system for the safe and convenient storage of LNG onboard. This is the first order for a Wärtsilä LNGPac system. The 25,000 dwt product tanker ‘Bit Viking’ is operated by Statoil along the Norwegian coastline, and the conversion will enable the vessel to qualify for lower NOX emission taxes under the Norwegian government’s NOX fund scheme. ”By carrying out this large-scale conversion project, and equipping the vessel with the new Wärtsilä LNGPac system, the ship’s emissions will be significantly reduced. This obviously is of tremendous benefit to the environment, and is in line with both the letter and the intent of the Norwegian government’s NOX fund initiative,” comments Torkel Hermansson, Managing Director of Tarbit Shipping. The contract covers the conversion of the ship’s two main engines to gas-fuelled propulsion, all adjustments to the ship’s systems necessitated by the conversion, the updating of the vessel’s classification certificate, and the supply and installation of the Wärtsilä LNGPac system, including two 500m3 LNG storage tanks. Wärtsilä is responsible for carrying out everything involved in the contract, and the schedule calls for completion by June 2011. 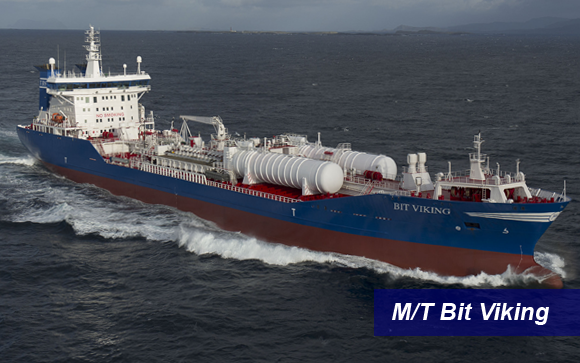 The ‘Bit Viking’ has twin screw propulsion, with each screw currently powered by a 6-cylinder in-line Wärtsilä 46 engine running on heavy fuel oil (HFO). The conversion involves changing these to 6-cylinder in-line Wärtsilä 50DF dual-fuel engines that will operate on LNG. The Wärtsilä LNGPac is a total system developed by the company to enable the safe and convenient storage of the gas fuel onboard ship, and to facilitate bunkering operations. The ‘Bit Viking’ is built with double engine rooms, propellers, steering gears, rudders and control systems. After conversion, the ‘Bit Viking’ will be one of the safest and most environmental friendly 25,000 ton product tankers in the world. Tarbit Shipping is a Sweden-based company that has been transporting bitumen, petroleum products and chemicals since 1962. The company prides itself on its high level of environmental safety, and this conversion project is in line with this philosophy.